Cajun Navy Foundation (CNF) is only as effective as its partnerships. CNF is proud to join efforts with United Peace Relief (UPR), Organic Valley, Dr. Bronner’s and Grassroots Aid Partnership (GAP) to assist with recovery efforts in areas shaken by Hurricane Florence. Nothing can stop these organizations when they join forces with each other and with generous companies, big-hearted donors and dedicated volunteers. UPR board member Aslan Walkon said that this is probably the longest relief effort he has ever participated in. Walkon sees Pender as a county whose needs are among the most under-met in North Carolina. 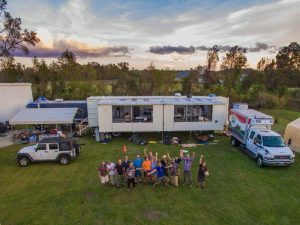 “As many of you know, for this deployment in the wake of Hurricane Florence, UPR and Family and Friends Relief Effort (FFRE) have teamed up as always with Organic Valley; but now have also teamed up with Dr. Bronner’s. Very exciting times! To those who are volunteering, wait til you see the kitchen the Bronner’s camp brought. It’s basically a semi-truck that unfolds and becomes massive,” said Walkon. 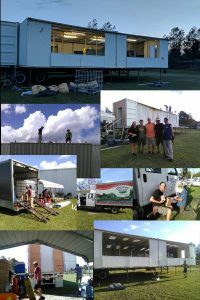 The hauling of the kitchen was donated by Cajun Navy Foundation and Carolina Disaster Relief. Walkon said that the need is very much still present in Pender County, and that the feeding operation could possibly become the largest in the area. The fully operational kitchen is currently on the ground trying to get the word out that there are hot meals and food boxes available in Rocky Point, NC. The pop out kitchen provided by Dr. Bronner’s can feed thousands per day. When charitable organizations, companies and individuals such as these collectively take responsibility for vulnerable areas in a time of crisis, everyone wins. We can all be a part of the mission by uniting to provide immediate and ongoing support to these communities. Join CNF in its endeavors to engage as citizen-led relief to those in need.